Delicious is a common adjective we hear from this gluten free carrot cake recipe. Not for the novice, but if you’re good at keeping focused then you can likely do this. The squares in a 13×15″ pan are the easiest, but a scrumptious 3 layer gorgeous gluten free carrot cake is irresistible even to the non-GF-er which is a relief to only have to make 1 dessert for all! For nut allergies or making for a crowd, leave out the almonds, as they are visually undetectable, to be safe. Combine flour, baking soda, baking powder, salt, and spices set aside. Combine butter and cream cheese in large mixing bowl, beat until light and fluffy, Add remaining ingredients. 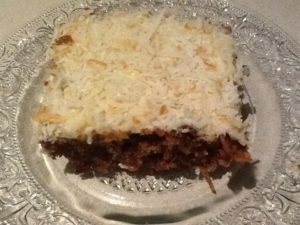 After frosting the cake, top with toasted coconut. Refrigerate cake before serving. Gets better with age – as flavours meld overnight.